TO SOPHISTICATE - alter and make impure, as with the intention to deceive; "Sophisticate rose water with geraniol". To alter; pervert: "to sophisticate a meaning beyond recognition". Created in 2008, Sophisticate Pleasure Records are specialized in the production of extreme electronic music artists. We are majorly focusing on Death Industrial, Old School Industrial, Power Electronics and, on a smaller scale, Harsh Noise, Death Ambient and Black Noise. We are producing different types of format, from CD and T-Shirt to CDR and vinyl, packaged in customized sleeves and cases. Submerging its listeners beneath a new layer of sludge and grime, Sistrenatus strikes again with a 20 minute cut of sprawling audio decay. Echoing percussion, shards of static, crude tape noise, wind and drone. Magnetic Resonance is an aural exploration of haunted spaces long forgotten. Factory duplicated Pro CDR in a Hand Made Pro printed Digipack. 200 copies limited edition. 8$US + Shipping fees. Yet another nail to your coffin hit right on the head by Sistrenatus. Magnetic Resonance is a CDREP from this behemoth Canadian industrial project taking the genre by storm and treading new ground in the realm of death industrial. This little release is no exception. Magnetic Resonance consists of one track that spans 20 minutes and more-or-less contains 4 separate movements. The first portion is a throbbing industrial dirge that slowly builds to a heavy rhythmic séance and straddles the line between death industrial rhythms and “beats”. This portion of the track reminds me a lot of Negru Voda. The drums are processed to hell with filters, added blasts of noise and other industrial sounds in the background (the very subtle incessant beeping is inescapable and really makes me feel like a dump truck is driving over me). The evolution of the track is palpable, especially when finally there are echoes of the initial rhythmic passages that reappear in a new guise with more musical elements sounding like a heavier and clearer Sektor 304. The track moves on to epic distorted synth drones with some vague glassy textures on the fringes and finally builds to a thick wall of noise before exploding into a very slow pulse of pure sound. The production is absolutely phenomenal, with the distortion having a perfect blend of crunch and grit. Magnetic Resonance is an epic track packed to the brim with industrial samples, distorted textures, carefully constructed synth work and succinct sound manipulation. 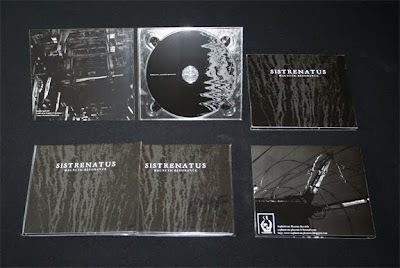 Sistrenatus is easily one of the best industrial acts active right now and Magnetic Resonance is testament that he is still improving with every new release. As a result of three years of hard work, this Death Industrial/Power Electronics opus explore different aspects of Human psychology and is a journey right into the hidden sides of the Artist mind. *Aside from a minimalistic first track, this is really quite violent and intense - heavy frequency oscillations, feedback squelch, extreme (!) vocal outbursts, and grimey, distorted electronic filth.. Regarded as a combination of Death Industrial and Power Electronics, this album is well produced and mastered with a good, spacious sound that is upfront when needed and laid back without being too distant when necessary, such as on the drone and sample structured opening piece from which the album gets its title. It does have a nice, mysterious sound to it, although sadly I don't understand the language involved, it seems to invoke the feelings of introversion when faced with other peoples' happiness. To a degree. From there, it seems to be more PE territory with harshly screamed and shouted vocals, pulsing electronics and harsh chunks of tightly mastered feedback noise. There's a hell of a lot of echo and delay on this album which is helpful for the "dark" quality required but there's a bit too much reliance on it, I would argue. Still, it all makes for a successful sound when blasting ahead. The problem seems to be that such tight control over the sounds means that they sound somewhat stagnant and un-moving over the course of the pieces, particularly the longer ones. Is this intentional? Probably. A very minimal aesthetic seems to be working here, but fortunately the production means the sound is more alive and powerful, such as when the rhythmic pounding kicks in on "Frustration", one of the album's stronger pieces (seems to be some variance in the mastering of volume, too, some things coming in much louder than previously on the album), although the screaming vocals are a bit over-used towards the end of the piece. High pitched, wordless screaming through effects seems to be something of a speciality for this project; he must rip his throat out live. The Power Electronics element does win out in the end but the darkly echoed production gives it a bit of a meaner edge. The packaging features modelled photos, with the artist on the back, naked, making himself vomit in a pot. All for art. No forthcoming releases are planned for a while. I had to cancel the The Vault/Kadaver split project because i have to deal with some issues. For now, I prefer to put more efforts in the distribution of my three first releases and wait until next summer before starting any other production project. Also, the Sistrenatus "Magnetic Resonance" is nearly sold-out, so act fast! Distributors/labels are welcomed to contact me. 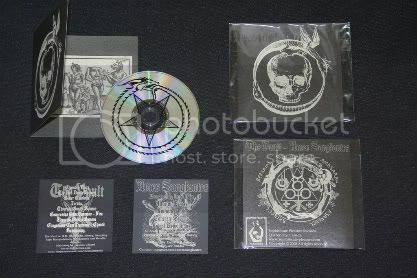 Few of them are back in stock in Malignant Records distribution catalog. The Dei Nostri album will also come back in the Malignant Records distribution list during the next weeks.